I just love Elizabeth Bradley‘s needlepoint designs. I have all her books, have done several of the smaller charts, but I have only done one of the big kits. Doing one can be daunting, but the time you spend in preparing your kit for stitching and the method you use for stitching will be greatly rewarded by the lovely finished result. When you order your kit, determine your background color. There are several standard background colors, one of which is included in the kit. If you buy your kit in a shop, the background color will probably be chosen for you. Your stitching will go more easily if you spend a little bit of time preparing your kit for stitching. Air out the threads by putting them in a basket or old cotton pillowcase. Now separate your wools for the design by color. I cut off a bit of each color and tie it to the color block on the side of the canvas. This is an extra bit of insurance for color matching. The colors on the canvas are not the same as the colors of the threads, so doing this will help you match thread to paint. The thread colors are very similar but the colors on the canvas are easily distinguished. Putting the samples with the color blocks can help in stitching — it certainly helps me. The canvas itself has the corners marked clearly, but it helps to mark the sides completely. Use a permanent, non-xylene or dye-based marker. Draw the lines along the sides matching the corners. If you are using one of the darker background colors and don’t want needlepoint dandruff, give the background a wash of color, just enough to keep the white from standing out. Paint the entire background area lightly with a wash of acrylic paint thinned with water. You can use broad strokes for the areas up to the edges of the design then carefully paint the area next to the design. Because the canvas is screened with oil-based paints, the acrylic paint doesn’t cover the design, making painting the background a bit easier. Remember, if you chose to paint the background, it doesn’t need to look great, it will be covered completely by the background stitching. This is just to make it look a bit more finished when stitched and is entirely optional. Finally tape the edges of your canvas as it is quite stiff and will catch on the wool. All Elizabeth Bradley designs are worked in Victorian Cross Stitch, that is Cross Stitch on canvas. It differs from Counted Cross Stitch in that each cross is made completely before moving onto the next cross. Like needlepoint, all the stitches go over intersections of the canvas. You should pick a direction for the bottom part of the cross (I used upper left to lower right) and use it consistently. A change in the direction of the cross really shows up. As with all needlepoint, the stitches should lay on top of the canvas, and not distort the canvas at all. Because you are doing Cross Stitches, the thread is thinner in relationship to the canvas mesh than is usually the case with needlepoint, so this level of tension was easy to maintain. Decide at the very beginning whether you are going to follow the chart (which comes with the kit) or the design printed on the canvas. Most people (myself included) have trouble moving from one method to the other. If you are going to use the chart, think about stitching on the back (blank side of the canvas). I chose to use the canvas. If you do this you will notice that sometimes the color change does not line up exactly on the intersection. In these cases, you will need to use the photo of the completed design and your own judgement to decide on the color. Spending time with your canvas examining it pays off in helping you plan your method of stitching. Many people start at one end of the design and work along vertical or horizontal rows parking the colors of thread in the background as they switch. Since I hate having threads hanging around, I went color by color, beginning with the lightest tones. Because there are blocks of color, I decided where to begin each color so that I had the shortest distance between areas, keeping my starts and stops of thread to a minimum. If there were more than seven or eight threads between two areas, I ended my thread, as Bradley suggests. Decide the direction of your stitching. Most designs are square and should be stitched in horizontal lines. Stitching your rows in the same direction will help them look more consistent. Bradley suggests that you always work your rows in the same direction (for example left to right). If you do this, end your wool and start up again whenever the row is longer than seven or eight stitches. Otherwise just move your needle to the beginning of the new row. If you go color by color, as I have, always go from the lightest thread to the darkest. This will not necessarily be the lightest color on the canvas. I look at the wools in my bag and pick the lightest to use next. The background should be made in rows in a single direction. It may not look like it as you are stitching, but this really makes a difference. The background is done in cross stitch as well. If you are going to finish your piece as a pillow, you will probably not want to add a border. They will however look outstanding when finished with Victorian-style fringes and trims. I’m thinking of using long bullion fringe on the edges of mine. Making multiple kits and finishing them as rugs is very popular with Bradley kits. A chart for a border is included with the kit and additional borders are found in Bradley’s books and on her website. They will also often have classes in both the US and UK on doing this. The back of the chart has detailed instructions on how to put together multiple pieces to form a carpet, how to join the pieces together and how to calculate how much wool you will need. In 2000, a Bradley wool rug won Judge’s Choice at the ANG Seminar. It is a real treasure and stunning. Bradley kits are tremendous fun, designed with care, using outstanding materials and with very complete instructions. I would recommend them to any needlepointer who likes traditional design. This has always been on my list for “someday.” Thanks for the article. I never would have thought of painting the background. I am a week away from finishing an Elizabeth Bradley needlepoint kit. I purchased TOBY THE PUG in 1992 at Bergdorf Goodman, a very upscale department store in New York City at a discount price of $101.00. I would have worked the kit much sooner but I didn’t know how to do needlepoint cross stitch at the time and tried the continental stitch which was a disaster! FAST FORWARD: It is now 2011 and during that time I learned how to do needlepoint cross stitch and started my project on January 17, 2011. The almost finished canvas looks beautiful! I decided on the hunter green background and recently ordered the wool from an E.B. site I found online. Unfortunately, I got laid-off from my job and have used all that free time needlepointing while looking for another position. I am interested in purchasing another kit but I know that is not going to happen. The kits are way out of my price range. I just got the Elizabeth Bradley Hydrangea kit but there isn’t enough thread to work the entire project. The kit also doesn’t contain a color chart which specifies the code for each color. Is there a book of Elizabeth Bradley’s that has the Hydrangea in it or is there a color chart available? Where is the best place to buy replacement thread. Thanks! Many of her kits are charted in her books, but if it is a newer kit, it will not be. Most companies that sell kits will provide you with the yarn you need to finish the kit, free of charge. You should go to their website (http://www.elzabethbradley.com) and email them about it. I am an avid needlepointer and have done a number of Bradley designs. Most of them have been copied from the patterns in her needlepoint books. I am currently doing the Roses Wreath and have done the Pansies, Irises, Tiger Lily , Violet wreath, the Whale etc. Right now I am really hoping that someone will have a Toby the Pug chart available. My seven year old granddaughter would love to have this as a pillow for her bed. I am also willing to trade the”Posy of Violets” chart for it. I live in the NYC Area so I am easy to reach. Hope you find a job. Thank you for the great information on working Elizabeth Bradley kits. Loved the background painting tip! in the future when buying these expensive kits from re- sellers in the future. If it helps (because these days it is sometimes hard to justify little luxuries such as fine wools for needlework! ), a lower impact purchase is buying the used EB charts on eBay and stiching on a blank canvas. Then, as your budget permits, you can purchase wools from the Elizabeth Bradley shop in Raleigh for about $5/card + shipping. Another option is one of the EB books (Amazon has them all and they are inspiring!). The Rabbits and Repeating Leaves from “Decorative Victorian Needlework” are two of her best designs. Save all you left over wool… you’ll soon have an “inventory” to sew new projects. After a recent Flea Market, I have 2 completed Elizabeth Bradley Bell Pulls – unframed – to sell on their behalf. As the kits alone cost $230, I would like to know your opinion as to the value of a beautifully COMPLETED needlepoints. I used the stab method and had no problem.
. . . [W]why do you write advise when you are such an amateur! I have just finished the Fox family rug and have started on a 6 piece Victorian animal rug. I have made up a way to sew the victorian crossstich in all directions. To the people who can not afford these overpriced kits, you buy the books, buy charts on e bay, do not buy charts that you can get much cheaper in the books and buy Appleton tapestry wool. Your advice is rubbish. It always baffles me, all these people who have just startede [sic] learning something. Why do you feel the need to teach others what you do not know yourself? And what is this, most people cannot switch between chart and canvas? Why not? Of course I look at the chart. I have only one real kit, the contented cat. One cannot trust the canvas. Not accurate enough. It is just a help. Only a beginner stich from canvas only. And children. The reason why you pick on or the other and don’t try to stitch from both is that they will not match up. If they do, it is only by chance. This happens and cannot help but happen because needlepoint canvas is not perfectly evenly woven, the count of the weave varies, only slightly in high quality canvases, but it does vary. When you put the design onto the canvas by mechanical means, silk screening in this case, you cannot make the adjustments for the variance in the canvas. As a result, intersections have more than one color on them and they will not match up with the chart. If you have been able to go back and forth, it’s because you are making the adjustments required yourself. For most people this is very difficult. Thank you so much for your comments and for allowing me to let you know about my background. I’m impressed that you have done so many Elizabeth Bradley kits and would love it if you could share with us how you do Victorian Cross Stitch in all directions. I agree that the price of the kits is very high and that using the books and charts with Appleton wools is a good alternative. I did not say don’t use the charts, just not to use them in conjunction with the printed canvas. Because of technical limitations with the material and the process, they will not line up. Now a little bit about me. 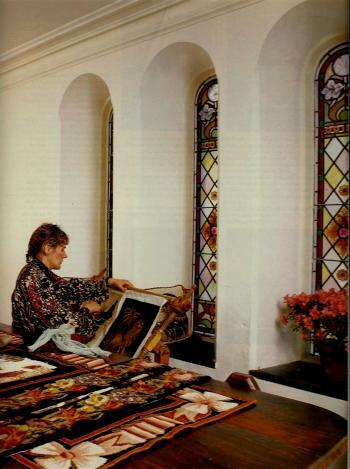 I have been doing needlepoint since the fall of 1970 and began designing my own projects a few years later. In my stitching life I have stitched probable 2000 or more projects and, at times have stitched over 100 projects in a year. I know over 500 different needlepoint stitches and many needlepoint techniques from Bargello to Goldwork. In spite of this knowledge and experience I’m always finding new things to learn. I made needlepoint my profession in 1995, creating the first on-line magazine, first for another company and for over a decade as this blog. I have written over 200 stitch guides, taught thousands of people needlepoint through my beginners course and have written or co-authored 13 books on needlepoint. I have taught nationally in competitive venues, locally, and in on-line forums. I have been published in needlepoint an craft magazines since the mid-a980’s. I try the products and techniques I write about. So in the case of these kits the advice comes from my experience, my knowledge of what most stitchers might find as stumbling blocks, and my knowledge of how the product is created. I found stitching these kits very enjoyable but I know from discussions with other stitchers the problems they have. This column is a result of those conversations. I’m glad your experience has been different and I would welcome any advice you could share with others who read this blog. Oh my – who knew needlepoint could create such emotion! I have been buying EB kits since the 80’s. Many are still in stash but recently I was inspired to pick up an old EB WIP. I use the canvas painting versus the chart because all does not line up. I am comfortable making the adjustments. I have also written the EB website when I ran out of one color for one kit and received what I needed. I love the Victorian CrossStitch – but it is a heavy and sturdy stitch. So I like to use it for seat covers. I also have 3 of 6 Victorian florals/animals completed for making a rug. I would encourage anyone to get her books and use the charts. I have done then on 24 count Congress cloth in plain tent to create some lovely small items. Thank you for bringing these designs and kits to everyone’s attention. Thank you for this post! I am a beginner to needlepoint and have the EB kits to be intimidating. Now that I know more about them, maybe I can try a small one. Thanks for explaining it so clearly!